When you're home for a quiet Saturday night it's always nice to find a great old movie on the telly. Last night, KQED (our local public television station) aired two gems from the 1930s which made my eyes pop with delight. The first was 42nd Street - an adorable "understudy fills in for the lead and saves the show" story, with some fantastic numbers from Busby Berkeley. The Depression-era fantasy continued immediately afterward with a life-long favorite of mine & my sister's: Top Hat. I remember watching this movie as a kid and being entranced by the dancing and the beauty. Also, I remember my sister's tap class did a routine to "Top Hat", so the song was something she'd sing all the time. It wasn't until I was much older that I realized how silly and transporting it is as a film. The sets are opulent, the plot is so breezy as to be non-existent, and the witty and racy dialogue is only memorable for about three scenes. Of course the comic stylings of the ensemble cast - a group that frequently joined forces for more RKO musicals - is light and enjoyable. In other words, it's the perfect bit of fantasy and humor for the down-trodden world of 1935. Then, there's the dress. One of the most iconic dresses in all of film, the maribou-feather dress for the "Cheek to Cheek" dance sequence is a pure delight. A nice layer to the plotline concerns Beddini, a comic stereotype of an Italian dress designer, who creates the clothes for Ginger Rogers' character. So Beddini is to have designed the dress, but in fact Ginger Rogers designed it herself and it was created by RKO costumer Bernard Newman. The dress looks white, but it's actually pale blue "Monet blue" as was requested by Ms. Rogers. When I re-watched the scene the other night, I was struck by the effortless elegance of the dance. Everything flows. The movement is graceful, light, and dramatic all at once. And the dress moves exactly the same way. The feathers contribute a lightness and movement that serves to enhance the grace of the dance. It's diaphanous and fluid at the same time - like she's dancing inside of a waterfall. The back story was quite a bit more complicated, including over 60 takes, a stubborn Ms. Rogers, and feathers all over everything. 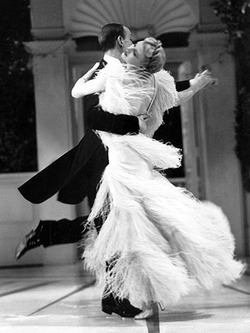 In fact, the dress was the one thing that made the filming difficult, and Ms. Rogers' refusal to change wardrobe earned her the nickname "Feathers". In fact, the dress kept shedding so many feathers (which you can even see in the film) that there was danger of the whole thing falling apart. In the end though, it (and the scene) are the most memorable parts of the film and the dress now resides in the Smithsonian. The complete story is summed up well in this article from the LA Times, which you should definitely check out. But in the meantime, here's the scene so you can see why this dress is so amazing. It's another great story about the creative process, working through problems to create something memorable (even if it's just a dance sequence), and how one dress can make magic happen!